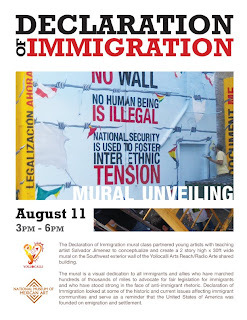 The Declaration of Immigration mural class partnered young artists with teaching artist Salvador Jimenez to conceptualize and create a 2 story high x 30ft wide mural on the Southwest exterior wall of the Yollocalli Arts Reach/Radio Arte shared building. The mural is a visual dedication to all immigrants and allies who have marched hundreds of thousands of miles to advocate for fair legislation for immigrants and who have stood strong in the face of anti-immigrant rhetoric. Declaration of Immigration looked at some of the historic and current issues affecting immigrant communities and serve as a reminder that the United States of America was founded on emigration and settlement.